Now here's a possible volcanic vent which you may not want to have pop up near an airport or seemingly out of the blue at a bit of a distance from a volcano (described as 'dormant'). I personally don't believe in 'dormant' volcanoes. I tend to think that where there ever has been any kind of volcanic activity, the old vents/exit points, I feel, are still vulnerable places. Also, it wouldn't surprise me in the least if Mother Earth (magma and associated volcanic materials) pushed their way up in new spots to surprise us all (well, some of us). That is really cool :-) Never thought I would read of a volcano coming up in the middle of a roundabout! It's fascinating, but on the other hand, I think I'd be hoofin' it to test the emissions of this thing (which I am sure the Italian scientists are doing). From what little I know of volcanic vents, they don't 'stray' too far from the live activity of the related volcano. I am guessing it may be an off-shoot of some deep activity. I can't get past a feeling of a possible sub-marine volcanic origin, or it could be a release from a pressurizing land volcano (maybe one, up till now, considered inactive or even extinct). But I am not a scientist with intimate knowledge of this region, so I may be way off with my feelings here. P.s. I have observed the tremor activity for the Mediterranean region for the last 7 days (ish) and there have been heaps of tremors, including some moderate ones, all over the Mediterranean region, and most of them have been at a fairly shallow depth - up to and around 40kms deep, not like many in the Pacific and South America regions - where many have been very deep. But that's another story for the earthquake thread. Been trying to find some indication that the Rome situation has been confirmed as volcanic. I saw speculation that it could be volcanic or perhaps just a burst pipe. I would of imagined this could have been confirmed by now. Yeh Locke...currently I am not 100% convinced it is volcanic - 80/20 (20 being something else - pipe?) at this point. The way the mud is being blown out of the hole, looks to me like it has an air blast, mixed with a heat source, combined with moisture - but not the saturation of the water bursting from a broken water pipe.....it's a bit of a mystery. I'll see if I can get a final confirmation on this too Locke. Ok...I've done a quick skip around Youtube and some other sites. I've posted two vids below which show similar behaviours to the Rome airport bubbler. I am going to say that I am quite convinced now (99%) that the Italy airport bubbler is volcanic. Apparently these 'vents' are not really uncommon in Italy. One of these killed a herd of farm animals in a field in Italy, when they apparently breathed the poisonous gases in. Anyway, check out the behaviours/sounds of confirmed volcanic vents in the vids below and compare them to the Itlay vid. Also, apparently the viscosity (moisture level) of the mud spirting out of the vent's hole is due to the season/water table level - according to one website (not a science one). I would need to learn more about this. I've been quite interested in the following 'story' surrounding Ethiopia (which we have chatted about before) and here's a new article regarding a magma pool below Ethiopia that scientists have been honing in on to study currently. "Giant reservoir of magma under Ethiopia may explain how continents break apart"
There is so much volcanic activity going on in the world at the moment. Below is a new video of a new island being 'born' off Japan's Izu Island region. Apart from approx. 35 volcanoes erupting around the Ring of Fire at the moment, below is the best video I have seen so far of Japan's new volcanic island, which is continuing to grow. On another interesting note about Pakistan's newest volcanic island, apparently it is reducing in size, which is frustrating locals because there is now less of an opportunity to earn income from the tourist trade. Nice videos there thanks Duck . I reckon this volcanic island is going to be more permanent than the one in Pakistan, because (in my un-scientific opinion) it is spewing out lava which will harden to rock, possibly forming some firmer foundations for this structure. Unless it collapses from within and sinks at some point, due to a 'withdrawal' of the forces creating it...will see. The Ring of Fire is one angry beast at the moment. I get a small feeling that this 'energy' (volcanic type) may creep or push further west, SW, NW, north and east around the ROF (into other old vulnerable spots - some considered dormant) or under some other coastlines of some continents and may also produce some more of these mounds in the future. The pressures, with all the volcanoes activated at the moment, seems rather highly charged - the "cup-may-spilleth-over" so to speak. (Amateur thoughts of course). check out this stunning photo of Klyuchevskoy Summit (volcano) in Kamchatka. Yep and impressive photo DW. For my 2 bobs, given the reference that the cloud climbs 1KM up, then the "fire pillar" is more likely to be a pyroclastic(?) lightning strike. Doesnt matter, impressive whichever. Not even... just lava flowing down the side of the hill. But still impressive. Nice contrast snow and ice on one and larva on the other. With the comparison of the two pictures, and considering the look of the night pics orange 'glow', it makes better sense that this is a flow and perhaps not a pillar of fire. I know DW posted a related post in the earthquake thred but though I would post this link here. 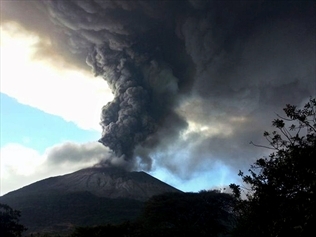 AUTHORITIES in El Salvador have begun evacuating an area around the Chaparrastique volcano after the peak shot a cloud of gas and ash about five kilometres high. 7 registered (Wrasse42, Farra, Homer, mysteriousbrad, ol mate, Sandbank, Sidney), 58 Guests and 3 Spiders online.